A couple Sundays ago, I was bogged down in terrible language fatigue. I was lost most of the morning in the general assembly, and also later when (trying to) talk Polish with friends. It was like my tongue was thick with fur and my brain was frozen, gooey molasses, and I don’t want to admit it, but I was so disheartened I went to bed and cried. The next day, I spent several hours at my friend’s house. She fed me and made me tea and her children were angelically happy and quiet and friendly. She and I talked of life and questions with no answers and miracles, and it was most relaxing and soul-nourishing. While I was driving home, it came to me: those hours were Polish submersion and I hadn’t even thought of it. My friend knows enough English that I could switch to that when I got stuck, but language was no barrier that day. I was amazed. I told this story to my Polish-friend-who-lives-in-Ireland, and she nodded with a simple explanation: “Good days, bad days.” She knows what she’s talking about it, and she’s right. Saturday I trotted over to the market to buy my fix of pickles. The sun was trying to shine, it was a weekend, there was a dusting of snow around–it was a nice morning. But all the adults I passed were scowling. They met my eye with such misery and coldness that it made me shiver and want to cry and keep my eyes to the ground. But the little girls in the line behind me were enjoying the snow, throwing little snow balls at each other, and one snowball nearly flew into the pickle barrel. The twinkly-eyed lady who fishes out the pickles for customers looked up and SMILED! She didn’t scold the girls for disturbing her, and I wanted to hug her. She and the little girls were the only bright spots in the market. Then I walked down another street, past more Very Grumpy People, and my heart was breaking for their bleakness and joy-less expressions. 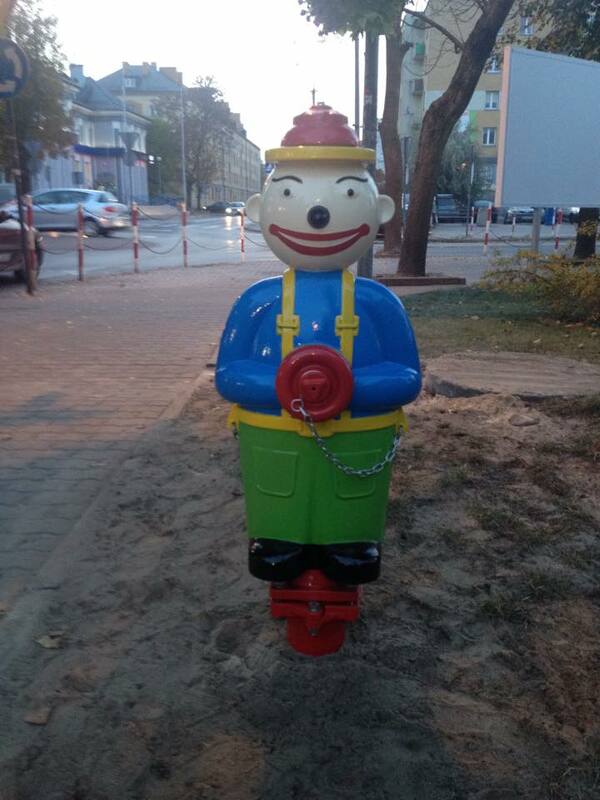 I walked past this fire hydrant, a colorful character who is slowly reclaiming this town from its former grim communist grey. but Saturday, in the cold wind and snow, someone had carefully put a stocking cap on his head. I chuckled aloud, and felt better the whole day. Good days, bad days. Bad minutes, good minutes. I tend to be all-or-nothing, so when it’s a bad day, it’s a Really Horrible Terrible Day and nothing will ever be right again. When I grow up, I hope I can remember to keep calm and not panic because the good minutes always come again. Even in the winter, even in Poland. I love it Anita! . . .yes even in Australia the good and bad come. Waiting for that to happen as well! 🙂 -the growing up and the good minutes to come back in hours! Wonderful writing, as always! I also liked the blog about the cards – amazing how creative you are!